LordsArt offers beautifully hand crafted personalized inspirational candles designed with an array of flowers, leaves, and decorations. Shop for Scripture and Blessings Candles, Wedding Candles, Personalized Candles, Memorial Candles and more. 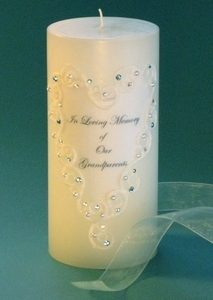 These beautiful candles make perfect gifts that will always be remembered.